PIN this recipe to your GRILLING board. Properly grilled chicken breast comes out juicy, delicious, with awesome grill marks that pack all the amazing flavor we expect from grilled meat. Although, if the chicken seasoning lacks flavor, so will the chicken. 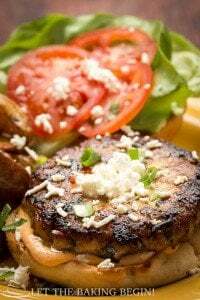 Not the case with the chicken kabob marinade we use for the grilled chicken breast in this recipe though! It is generally believed that marinating the meat will produce better flavor, and that might be the case, BUT! Whenever I make this grilled chicken kabob recipe, people ask me how long I’ve marinated the meat for and they’re always surprised when I tell them that I didn’t! So, go ahead and toss the chicken breast with the chicken seasoning ahead of time if you would rather have it ready to go when you need it, but don’t feel like you’ll be missing on any flavor if you don’t! How to make a juicy kabob? Use fresh never frozen meat. Freezing and defrosting the meat removes the juice from the chicken, leaving you with drier kabobs. This is true for any kind of meat, so keep this in mind. Do not overcook the chicken. Quickly grilling the outside of the kabobs locks all the juices inside. But, if kept on the grill long enough the juices will evaporate and dry up.Sometimes in the hunt for that really well browned outside, people overcook the meat, which removes all moisture from the inside, rendering the grilled meat dry. To still get the kabobs nicely browned on the inside without overcooking the inside, preheat the grill for at least 10-15 minutes before adding the chicken. Allow the grilled chicken kabobs to rest for a couple minutes after cooking to allow the juices to redistribute. Otherwise, they will leak out as soon as you bite or cut into the chicken, which means dry instead of juicy kabobs. How to prevent meat from sticking to the grill? Start with a clean grill.Preheat the grill for good 15 minutes on high to burn off any remnants of anything previously grilled. Then use a good grill brush to clean the charred bits off. Next, use tongs and go over the grill with a big chunk of a wet paper towel to remove any smaller pieces. Finally, wet a folded paper towel with oil and brush the grates with it. This will prevent the meat from sticking to the grill. Alternatively, you can turn off the grill, and quickly spray the nonstick spray onto the grates, then turn the grill back on. If you would rather not use the chicken breast, you can use boneless and skinless chicken thighs as I did in the picture below. Now that you have all the tools needed for successful kabob recipe, go ahead and make it this Memorial Day! Before that, tell me what’s your favorite dessert to bring to a picnic? 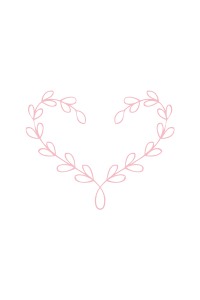 I’d love to hear what you make! Share in the comments below! How to make Grilled Chicken Kabob? Start by cutting the boneless, skinless chicken into 1.5-inch cubes. In a large ziplock or a large bowl, combine the chicken, spices, and oil, then mix everything together until the meat is evenly coated. Preheat grill to 400F. Meanwhile thread the chicken onto skewers, leaving at least 1 inch of space at the beginning and the end of the skewer. How long to grill chicken breast? 1.5 inch chicken kabobs should be done in about 10 – 12 minutes. Make sure to turn the skewers roughly every 3-4 minutes to ensure even cooking on all sides. According to USDA, the chicken must be at least 160F for safe consumption. What goes well with Grilled Chicken Kabobs? Easy Chimichurri – this parsley, garlic sauce is super easy, but oh so, so good! Tzatziki Sauce – cucumber, yogurt and garlic sauce that’s always so refreshing. Pickled Onions – recipe below! Simple fry sauce – (mayo+ketchup) and add some fresh pressed garlic to make it extra good. Spicy Korean Carrots – these are always a treat when I make them. If you’ve never had them, make them! You’ve never had carrot salad this good! 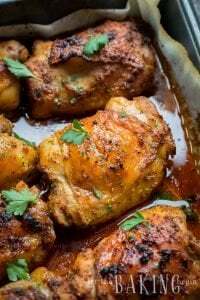 This Grilled Chicken Recipe is made with just a couple simple ingredients, but the chicken comes out juicy and flavorful. This is my go-to recipe for dinner under 30 minutes. The dry rub for chicken includes cayenne pepper for a good kick and smoked paprika for awesome flavor, this IS the best grilled chicken recipe marinade. Preheat grill to high heat (I heat my grill through for about 10-15 minutes). Mix all the cubed chicken and the easy chicken marinade ingredients in a bowl or a ziplock until the chicken is evenly coated. 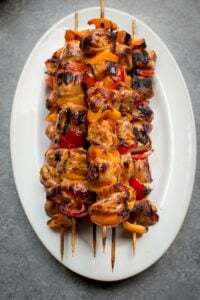 - At this point, the chicken kabobs are ready to be grilled or can be refrigerated until you're ready to grill. Make sure to bring the chicken to room temperature before grilling. Thread the chicken breast pieces onto skewers, leaving about 1.5-2 inches of space at each end. If using wooden skewers, remember to pre-soak them in water before using to prevent them from burning. Follow the instructions above the recipe card on how to properly clean the grill. Place the skewers on the grill and cook for about 3-4 minutes per side, about 10-15 minutes total, and all sides are nicely browned. Chicken breast kabobs are ready to remove off the grill when the thermometer inserted into the thickest piece of a kabob registers 160F and the juices run clear. Allow the chicken kabob skewers to rest for 3-5 minutes before eating. which one gives best taste – oil , yogurt or mayo ? If I choose oil then what type of oil would be best choice ? I prefer oil (not anything strongly flavored) or mayo. Yogurt does not give as good of a crust, but is lower calorie. 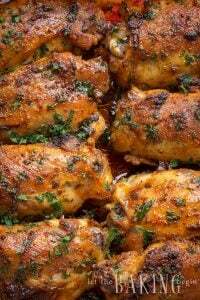 I want to make it with chicken thighs , how many lb (pound) boneless skinless chicken thighs I require ? I would use about 2 lbs of chicken thighs, since that is about how much 4 chicken breast weigh. Hi! 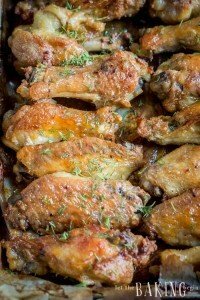 I can’t seem to find exactly what chicken seasoning you used for this recipe? I have included the chicken seasoning ingredients right in the recipe card now for easier navigation, but here’s the original link where you can find the chicken seasoning ingredients. Grilled Eggplant in Sweet Chili Garlic Sauce - Let the Baking Begin! This is THE BEST grilled chicken I’ve ever had in my life. I made it twice in 3 days. I used chicken thighs and it turned out sooo moist and I’ve done the marinating overnight and marinating right before grilling. No difference in taste. I couldn’t believe it, i have never been this excited about a recipe. You’re going to love the chimichurri sauce! Also, you can use the skinless and boneless chicken thighs with this seasoning as well, I have done it and it was just as good, if not even better because chicken thighs tend to have a little more fat, therefor even more juicy! I buy the skinless and boneless chicken thighs at Costco and love how convenient it is!